You probably don’t know that by ignoring the maintenance of Attic & Crawl spaces you are inviting trouble for yourself. Dark and damp places invite numerous troubles and these problems turn big from minute to minute. Shelling out huge money and evacuating property to get it back in proper shape are often the only steps left. Regular assessment, monitoring and upgrading, are important to keep Attic & Crawl spaces clean and comfortable. These measures also improve the effectiveness and efficiency of the property. Outfitted with latest technology and experienced staff, we, at Quartz Solutions, strive to provide customized and hassle free Attic & Crawl services at the most competitive prices. 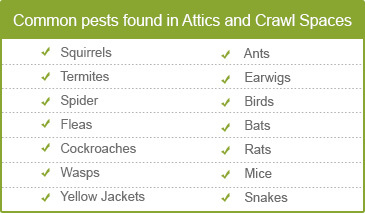 Pests, termites, damaged ducts and impaired insulation system, the problems that find roots in the attic and crawl spaces may be numerous and uncountable. Leaving them unattended may soon wreck havoc around the property. Extensive damage to property, exorbitant monetary outflows and health concerns, the damage may be beyond comprehension. Mold and mildew thrive on excessive moisture that makes way through leaking ducts. This makes the attic and crawl spaces humid and stinky. Insects like wasps and roaches leave a trail of bacteria that spread harmful diseases. Pests and termites nibble upon wood and wooden structures. They cause severe damage to the foundation of the property. Animals, like rats and mice eat upon furnishings and upholstery. Their uncontrolled movements hamper air ducts, electric wires and much more. Leaking air ducts may release harmful gases into living areas; causing severe breathing troubles. Clean and well maintained attic spaces increase the efficiency and effectiveness of your homes and offices. Checking the damage and correcting it at the earliest cuts the risk of damage and expenses to a great extent. Our team of experts will carry out the preliminary inspection free of cost. Checking ducts and wiring system, presence of pests, termites, and infestations and testing area for leaking gases if any, the team will assess the area for everything. Depending upon the problems and requirements, the team will put forth the most comprehensive plan at the most reasonable price. 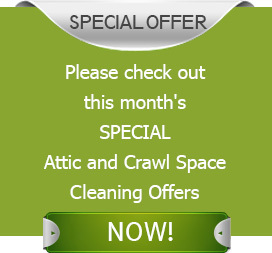 Looking for premium attic and crawl cleaning services at the most affordable prices? Look no further! We, at Quartz Solutions, strive to provide tailor made plans that best suit your needs and pocket. We adore Lodi and the people living in this small borough in Bergen County, NJ. Home to nearly 24,000 people, Lodi has beautifully built homes, office structures and schools. Let us be your undisputed choice in taking up all your attic related jobs. Rest assured our dedicated team will help you keep your property effective and efficient for years to come. Call Quartz Solutions 201-205-2042 and your complementary inspection today! Knowledgeable crew. Answered all my questions patiently. Professional execution and great results! Good job!